The perspective tool allows you to deform artwork by creating a rectangular bounding box around it and allowing you to manipulate any of the four corners. The selected artwork will be deformed to fit the shape you make by simulating a perspective effect. 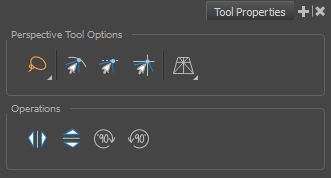 In the Tools toolbar, select the Perspective tool. NOTE For tasks related to this tool, see Deforming a Drawing Using the Perspective Tool. Lasso: Allows you to select multiple elements by drawing a lasso around them with your mouse. Marquee: Allows you to select multiple elements by drawing a rectangle around them. This is faster, as you only need to drag your mouse from one corner of the rectangle to its opposite corner, but it may not be as precise as you want. TIP You can press and hold the Alt key to temporarily use the other selection mode. When enabled, while moving a selection, the mouse cursor (along with the selection) will snap against the nearby points and contours of your artwork, allowing you to snap parts of your artwork together. When enabled, while moving a selection, the rectangular bounding box of the selection will snap to the rectangular bounding box of any other drawing stroke in the drawing, allowing you to align drawing strokes laterally. When enabled, while moving a selection, the mouse cursor will snap against the intersecting points of the grid. TIP To display the grid, select View > Grid > Show Grid from the top menu or press Ctrl + G.
Perspective: Deforms the selection by simulating a perspective effect. Lattice: Deforms the selection by simply making the artwork fit the bounding box, without applying a perspective effect. Rotates the selection 90° clockwise. Rotates the selection 90° counterclockwise.